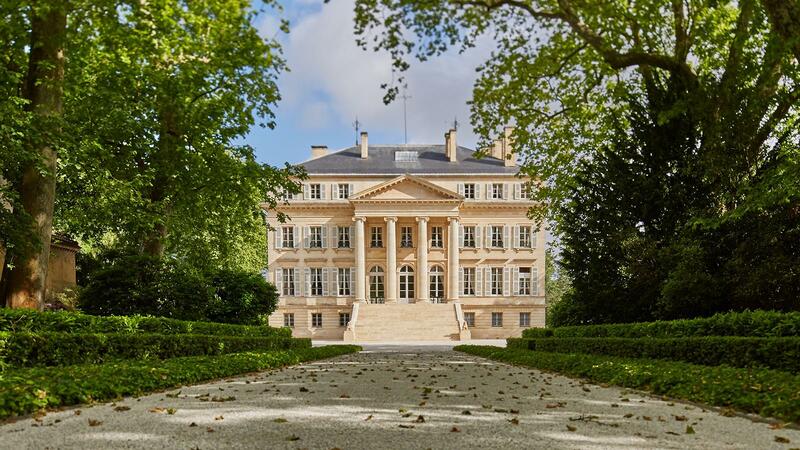 Château Margaux welcomed home Philippe Bascaules last year. Last year at this time, Château Margaux's Philippe Bascaules had barely started his second tenure at this venerable first-growth; now he's a bit more settled in. "It's a little easier to talk about the wine," he says with a gentle smile. There was just a 10 percent loss of crop here in 2017, due to the frost, and yields were a decent 2.5 tons per acre. The 2017 Margaux Pavillon Rouge (second wine), a blend of 76 percent Cabernet Sauvignon, 17 Merlot, 4 Petit Verdot and 3 Cabernet Franc, represents 22 percent of the crop. It's silky and refined, with a light mineral edge giving it spine while alluring lilac, cassis and damson plum fruit glides through. It has flashes of rooibos tea and incense and is tightly wound for now but with lovely perfume. "Acidity is a little lower but alcohol, is the same as '16," says Bascaules. "Yet the impression of freshness is there. Even with the amount of tannins in the wine, which is more than '16 and the same as '15. It's a surprise for me, because with the September rain (2 inches), I thought there would be some dilution, But the drought was very impactful on the structure of the grapes." Harvest here started with Merlot on Sept. 18 and Sept. 28 for Cabernet, finishing Oct. 3, noteably later than the properties further up the Médoc I visited previously. "We waited, to take the risk. After picking some Merlot, we stopped and waited a week. When you delay, you get more opulence and concentration, but you lose freshness. So it's a difficult decision. You know you won't win everything, so you have to choose." It would seem Bascaules and technical director Sebastien Vergne chose well. The 2017 Margaux grand vin, 89 percent Cabernet Sauvignon, 8 Merlot, 2 Petit Verdot, 1 Cabernet Franc, represents 37 percent of the crop. It's also quite tight, with a velvety edge, bright minerality and pretty streaks of lilac and lavender. The red currant and plum fruit is pure, but a bit in reserve still. Very long and tightly grained though, it's not the showstopper that 2015 is, but this is very, very serious as usual. The 2017 Pavillon Blanc is a rapier as usual, with bright, crunchy and energetic verbena, honeysuckle and chamomile notes leading the way, backed by lime zest, white peach and quinine notes. "The '17 in white is quite similar to '15 and '16 for us, with tension and low pH," says Bascaules. Just next door is Château Palmer, also a regular stop during my en primeur visits. You can go back and look through several years' worth of blog posts, starting with my notes from last year. General director Thomas Duroux continues his sterling tenure here, having piloted Palmer into fully biodynamic farming methods, while continuing to experiment (successfully) with lower and lower sulphur additions in the wines. As for '17, "[37 acres] out of  were hit by frost, but the parcels that weren't hit did very well in terms of yields and quality," he says. "So ultimately we are OK. The yield overall is [2.8 tons per acre], but the plots that weren't touched by frost got up to [3.3 tons] for us, which is great, and a sign that the conversion to biodynamics has taken hold and the vineyard is getting stronger." "We knew from July that we would not have a powerful vintage, as there was no hydric stress (due to the late June rains) and thus no big phenolic buildup. When there is early vegetative growth that stops early you get a big buildup of phenolics, such as '15 and '16. When the vegetative growth stops late, such as '14, the wine is not as concentrated." "The little bit of rain in September (2.75 inches) accelerated the ripening process and we wound up harvesting early with the fruit in good condition, a nice aromatic profile and ripe but delicate tannins." "The easy way to look at Bordeaux is that wines that are big and concentrated age well. A more sophisticated way is to think that wines that are balanced age well. Just look at Burgundy—how those wines age. Are they big? In 2017 we had to be careful not to push too much and wind up with tannins, then a hole, then more tannins. The key was to extract gently, early in the vinification, and then build the wine from there." Palmer's commitment to biodynamics seems to be paying dividends. The 2017 Palmer Alter Ego, 53 percent Merlot, 41 Cabernet Sauvignon, 6 Petit Verdot, is quite juicy and full in feel, with dark mixed berry fruit inlaid liberally with bay leaf and lavender notes. There's a good brambly edge through the finish, but it's relatively open in feel overall. The 2017 Palmer grand vin, 54 percent Merlot, 42 Cabernet Sauvignon, 4 Petit Verdot, is juicy, broad and deep, with waves of currant, blackberry and plum fruit carried by brambly tannins. It's very well-integrated, with a finish that flows beautifully over notes of graphite and tobacco at the end. It's not as densely packed as 2015 and '16, but this is a very, very strong showing already. For those who think corporate ownership means risk-averse winemaking driven by bottom-line-only thinking, utilizing conventional farming and resulting in "soulless" wines, take a look at Château Dauzac. Owned by insurance firm MAIF, Château Dauzac caught my eye back in 2011, with their 2009 vintage. Owned by MAIF since 1988, the property had been managed by André Lurton until 2013, when ownership brought in Laurent Fortin. He immediately started shifting away from conventional farming. Today the 296-acre estate has its own biodiversity zone, with 121 acres of vineyards now under biodynamic farming practices. The vineyard is broken down into 68 percent Cabernet Sauvignon, the rest Merlot. Some Petit Verdot is planned for planting in the near future. In addition, investments in the winery in 2014 included a new range of smaller tanks for intraparcel selection. The winery even went vegan in 2016, removing all animal products from production (such as egg whites for fining). All of this has paid dividends: The wine here is notably bright, purer and more energetic, and this is now a winery to seriously watch. As for 2017, there was no frost affect at all here. The 2017 Dauzac, 69/31 Cabernet Sauvignon and Merlot, is given a 10-day cold soak in stainless steel to start, with the grand vin lots then moved to wooden vats for fermentation. Aged in two-thirds new oak, the grand vin is very supple and silky in feel, with charming raspberry and plum puree flavors flecked with floral and anise hints. It has a flash of dusty tannins and nicely embedded acidity carrying the finish. Recent vintages of the wine hit U.S. retail shelves at around $45—a terrific price for character-filled, soulful and ageworthy Bordeaux.